As the new semester approaches, you’ll want access to a variety of information from Stonehill. 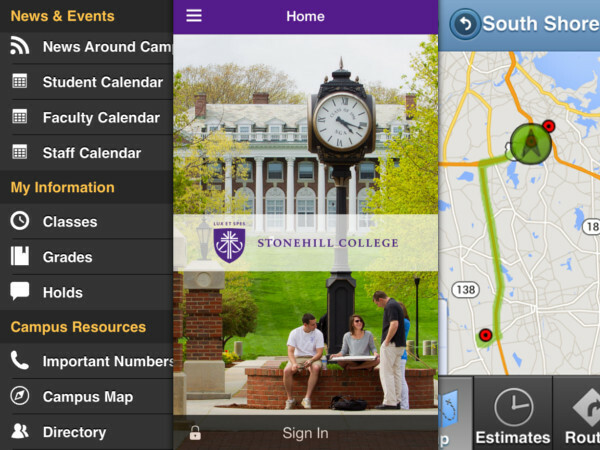 The My Stonehill mobile app provides convenient access to a variety of information for the Stonehill community. What’s for lunch at the Commons on Tuesday? Check out the dining menus from the app. When will the shuttle arrive at Braintree Plaza? The Skyhawk Shuttle feature shows real-time GPS tracking of the shuttle. When’s the next women’s basketball game? The Athletics feature gives you scores and schedules. If you aren’t one of the over 2,220 users to download the app, search for "Stonehill College" in the App Store for iOS devices or Google Play Android devices, or just use these links. The app is available to anyone at no charge. However, access to course information, the directory, and other privileged services require a Stonehill username and password. Please contact the IT Service Desk at 508-565-4357 or service-desk@stonehill.edu if you have any questions.